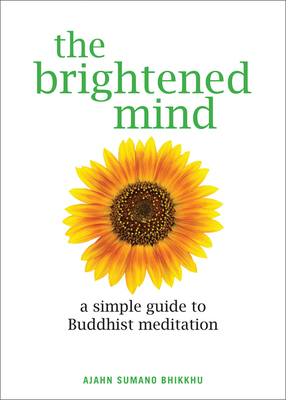 The Brightened Mind: A Simple Guide to Buddhist Meditation (Paperback) | Tampa's only full service INDEPENDENT bookstore. The brightened mind is one that is able to make better choices," says Sumano Bhikkhu. Having left the hectic world of Chicago real estate decades ago to become a Thai Buddhist monk, he knows what he's talking about. This simple, short introduction to meditation, particularly well suited to young people, can help anyone rattled with the stresses of living in today's society rife with financial uncertainty, war, crime, and the psychological assaults of bosses, teachers, and the media. His methods increase awareness, strengthen positive mental states, and develop insight. Eventually, the feeling of being overwhelmed becomes replaced with a sense of innate brilliance and trust in one's natural abilities. Moreover, the meditation Sumano teaches opens access to the infinite wisdom of the Universal Mind. An appendix on lovingkindness is an added benefit, providing the tools needed to face all challenges with a poised, cool, and compassionate heart. Ajahn Sumano Bhikkhu was part of the original group of monks and yogis to visit England in the mid-70's. He was the first Westerner to be ordained in the tradition of Ajahn Chah. During the seven years he lived and trained in England, he worked to restore the old Victorian estate that has become the Dharma lotus of Theravada Buddhism. From this auspicious beginning more than ten centers in Europe have been established and are flourishing. As a lay individual, Ajahn Sumano Bhikkhu was one of the original benefactors in the purchase and development of Cittavivekn, a cave in northeast Thailand. Since 1998 he has traveled throughout the world leading retreats and spreading his dream of establishing a Spiritual Park outside of Bangkok which would bring together all the world's religions in the spirit of Unity and Peace. This center would teach skillful ways to live in the world and to accept and respect all Beings as brothers and sisters. He has written many books on contemplative practice in the forest tradition. Those available in the U.S. are Questions from the City, Answers from the Forest, and Meeting the Monkey Halfway. "The American Buddhist monk Ajahn Sumano Bhikkhu (Questions from the City), one of the early Western students of Ajahn Chah and founder of ten Theravada Buddhist centers across Europe, is an experienced author. This most recent, brief, accessible book focuses on a simple aspect of Buddhist practice: meditation, keyed to bring about focused awareness, which ultimately will bring readers closer to the Universal Mind. VERDICT Not for beginners in Buddhism, Ajahn Sumano's cheerful and direct text will be a true eye-opener for practicing Buddhists. "This simple, short introduction to meditation, particularly well suited to young people, can help anyone rattled with the stresses of living in today's society rife with financial uncertainty, war, crime, and the psychological assaults of bosses, teachers, and the media. His methods increase awareness, strengthen positive mental states, and develop insight. Eventually, the feeling of being overwhelmed becomes replaced with a sense of innate brilliance and trust in one's natural abilities. Moreover, the meditation Sumano teaches opens access to the infinite wisdom of the Universal Mind. An appendix on lovingkindness is an added benefit, providing the tools needed to face all challenges with a poised, cool, and compassionate heart. "This simple, short introduction to meditation, particularly well suited to young people, can help anyone rattled with the stresses of living in today's society rife with financial uncertainty, war, crime, and the psychological assaults of bosses, teachers, and the media." "This is beautifully put, and a valuable reminder that meditation can be something we let happen rather than make happen. Sumano's strength is in emphasizing the "naturalness" of meditation. We don't try to "do something," then Ajahn reminds us, but rather meditation is ultimately "a way of undoing and letting go into the smile." The extraordinary thing is the very compact way in which he's done this, by simplifying his presentation of the spiritual path down to those three key activities of letting meditation happen, paying total attention, and committing ourselves to excellence. I'd highly recommend Sumano's spiritual manual. Monday: 11 a.m. - 5 p.m.
Tuesday - Saturday: 10 a.m. - 7p.m.